Knee Sleeves (1 Pair) - Superior Quality, 7 mm Neoprene Compression Knee Supports - Perfect for CrossFit, Weightlifting, Powerlifting, Running and all Sports - Ideal for Men & Women - Lifetime Warranty. FOAM ROLLER - Trigger Point - Stronger and Harder for DEEPER Massage - QUICK START guide - Perfect Muscle Roller for Home, Gym, Pilates, Yoga - 14cm x 33cm - Includes two FREE Spiky Massage Balls. Multipurpose Exercise Mat - Can be used for Yoga, Pilates, Stretching, Sit-Ups, Aerobics, Camping, Picnics, Sleepovers. 183cm Length x 60cm Width x 1.2cm Thick - High Density, Lightweight, Durable NBR Foam.Carrying Strap Included - Easy to transport, roll up and store away. Non Slip, Moisture Resistant and easy to clean. • Multi-Purpose - Brilliant for anyone participating in Yoga, Pilates, Stretching, Aerobics and other floor based exercises. This Mat can also be used for Camping, Fishing Trips, Picnics or Sleepovers! 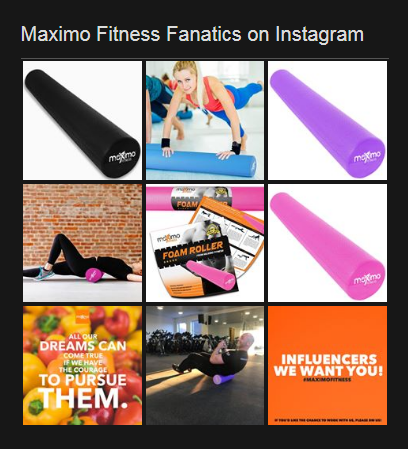 Maximo Exercise Mat - Premium Quality Gym Mat - Multi Purpose - 183cm Length x 60cm Width x 1.2cm Thick - Perfect for Yoga, Pilates, Sit-Ups and Stretching - Lifetime Warranty. Resistance Bands - Five Loop Bands - Perfect for Mobility & Strength training, Yoga, Pilates or Injury Rehabilitation - For Women & Men of All Ages - Instructions Included - Lifetime Guarantee! FOAM ROLLER - Trigger Point - STRONGER and HARDER for DEEPER MASSAGE - Myofascial Release - QUICK START guide - Perfect Muscle Roller for Home, Gym, Pilates, Yoga - 14cm x 33cm - Lifetime Guarantee - RED. Massage Balls - Pack of 3 - Includes 2 x Spiky Massage Balls and 1 x Lacrosse Ball for Deep Muscle Massage - Perfect for Back, Legs, Feet & Hands - 1 Year Warranty. Skipping Rope - High Speed Cable Jump Rope - Ball Bearing for Fast Skipping and 'Double Unders' - Ideal for Cross Fit, Muscle Tone, Warm Up and Weight Loss - Lifetime Guarantee. Unopened items within 30 days of delivery for a full refund. © Maximo Fitness All Rights Reserved.